Your roof is crucial to your home’s overall value. When your roof is damaged or wearing out, you may wonder whether you should have it replaced or repaired. You can hire a Palo Alto roofing contractor to inspect your roof and look for specific signs of deterioration. By fixing your roof or putting on new material altogether, you can safeguard your home’s value and also protect the inside of your home. When you contact a roofing company in Palo Alto, contractors will start out by asking if you want your roof replaced or repaired. If you are unprepared to answer this question, you could risk spending more money and wasting more time than what is necessary. To make the final determination, you should examine your roof and see what kind of damages can be found. Based on your findings, you can then decide if you want the roof replaced or repaired. You may want it repaired if your roof was damaged in a storm, for example. High winds, hail, and excessive rains can tear off shingles and tar paper. When you look at your roof and see missing shingles or tar paper flying up in the air, you should know that these damages can be fixed relatively easily and quickly. Your homeowners’ insurance company may even pay for most or all of the related expenses. If you inspect your roof and find holes, gashes, and huge sections of missing shingles and paper, you probably would fare better to have the entire roof replaced. Again, your insurance may pay for the costs involved in the replacement. Repairing this damage would be too costly and too time consuming. You will save money and also get the job done faster if you choose to have the roof replaced. When you want the roof replaced, your chosen roofing contractor will bring a large enough crew to get the job done in a matter of days. They can bring along the needed material if you are unsure of what you will need to get the job done quickly. 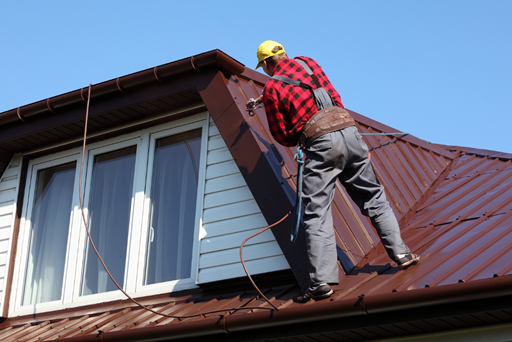 Roofers generally know what kinds of materials are best to use for the area and for the kind of house you have. They also can check with your insurer and make sure that the materials are insurable.